Stir Stick, Boxcutters, Jigger, Citrus Juicer, Strainer, Flûte. 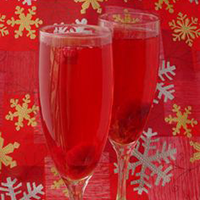 In a Flûte, put the Lime Juice, Vodka, Triple Sec, Cranberries Juice. With Stick, shake gently. Add the very cold Soda, and the Raspberries.